Children will simply adore constructing these dinosaurs which become a fabulous toy ready to roar and roam! Stage one is constructing the wooden 3D skeleton by following the numbers. Stage two is to use the special air-drying modelling clay to add the flesh in whatever design they like. Fabulous for fine motor skills and creative and imaginative play. Choose from T-Rex, Stegasaurus, Spinosaurus, and Triceratops. 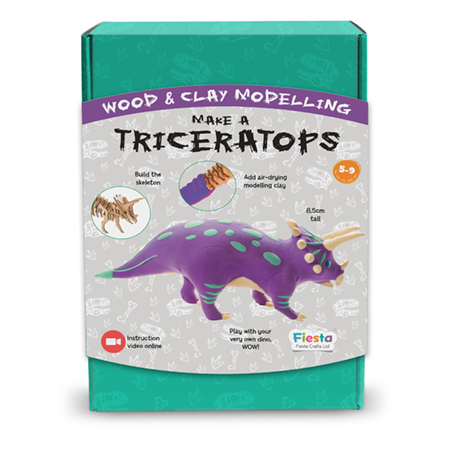 Each of the 4 sets comes complete with push out wooden pieces, modelling clay in different colours, shiny eyes and a fact card with loads of information to satisfy young dinosaur fans. Makes a fantastic gift all round.